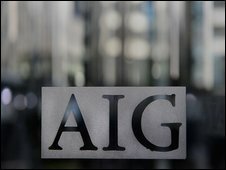 Ailing insurer AIG will be required to pay back hugely controversial bonuses it awarded after taking public bail-out money, the US treasury secretary says. In a letter to congressmen, Timothy Geithner also said $165m (£116m) would be taken from $30bn the firm is due to get as part of its government bail-out. 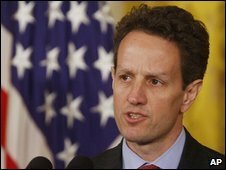 The plan comes after Mr Geithner faced heavy criticism for his handling of the increasingly controversial issue. Republicans said he should have done more to stop the bonuses being paid. Frustration has been growing over the bonuses, and reports say that AIG offices have received hate mail and even death threats. On Monday President Barack Obama called the AIG bonuses "an outrage". The BBC's James Coomarasamy, in Washington, says these are uncomfortable times for Mr Obama. The president is trying to channel public anger over the bonuses without becoming the object of that anger himself, our correspondent says. Republicans have raised questions about when Mr Obama was told about the bonuses - and also criticised Mr Geithner for not preventing the payments before they were paid. In a letter to Congress leaders, Mr Geithner outlined the measures he had taken to try to stop the bonuses being paid. He then confirmed that the bonus payments would be deducted from the next instalment of AIG's $180bn bail-out package. "We will impose on AIG a contractual commitment to pay the Treasury from the operations of the company the amount of the retention awards just paid," Mr Geithner's letter said. "In addition, we will deduct from the $30bn in assistance an amount equal to the amount of those payments." Politicians have been anxious to criticise the bonuses - with one congressman even suggesting that AIG executives receiving bonuses should kill themselves before swiftly retracting his statement. On Tuesday, the politicians' anger was stoked by a letter from the attorney general of New York state, Andrew Cuomo, revealing more details of the bonuses. He said that 73 AIG executives - including 11 who no longer work for the company - were each last week given bonuses worth more than $1m. Before Mr Geithner's announcement, Nancy Pelosi, speaker of the House of Representatives, had said several committees were looking at passing legislation this week to reclaim the money from AIG. And Senate Democrats wrote to AIG Chief Executive Edward Liddy on Tuesday calling on him to hand over the bonuses. "If these contracts are not renegotiated immediately, we will take action to make American taxpayers whole by recouping all of the bonuses that AIG has paid out to its financial products unit," the letter stated. The financial products unit, the letter stated, is seen as being primarily responsible for the "near-failure of the company". Mr Liddy has said the bonuses were paid to honour contracts AIG agreed to before the firm's value plummeted when the financial crisis set in last year. He is due to testify before a House sub-committee on Wednesday. Analysts predict he will face a tough set of questions.